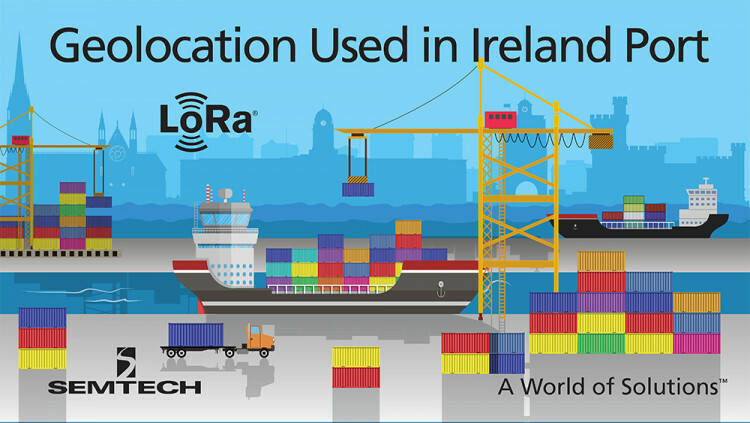 Semtech Corporation (Nasdaq: SMTC), a leading supplier of analog and mixed-signal semiconductors, today announced that its LoRa® Wireless RF Technology, featuring native GPS-free geolocation capabilities, has been integrated into Ireland’s Port of Cork LoRaWAN™-based Internet of Things (IoT) network solution to track shipping containers. Designed by Net Feasa, a service provider for next-generation IoT networks, the Port of Cork IoT network solution enables LoRa-equipped sensors with Semtech’s geolocation, placed in shipping containers, to detect the opening and closing of the containers’ doors, monitor the temperature of heat-sensitive cargo, and provide end-to-end tracking of each container. The information captured from these end points is passed to LoRa-based gateways which transmit the data to a network and application server for processing, and providing real-time information and automated alerts on cargo status to both merchants and port personnel via computer or mobile device. The sensors do not require GPS and use batteries that can last for up to 20 years, making it a cost-effective tracking solution for customers that use the Port of Cork. Net Feasa worked with Pervasive Nation (CONNECT), an Irish nationwide research and innovation IoT testbed, and OrbiWise, a leading provider of infrastructure solutions for IoT networks, to provide this smart solution. All statements contained herein that are not statements of historical fact, including statements that use the words “enables,” “developed for,” “has the capacity to,” or other similar words or expressions, that describe Semtech Corporation’s or its management’s future plans, objectives or goals are “forward-looking statements” and are made pursuant to the Safe-Harbor provisions of the Private Securities Litigation Reform Act of 1995, as amended. Such forward-looking statements involve known and unknown risks, uncertainties and other factors that could cause the actual results of Semtech Corporation to be materially different from the historical results and/or from any future results or outcomes expressed or implied by such forward-looking statements. Such factors are further addressed in Semtech Corporation’s annual and quarterly reports, and in other documents or reports, filed with the Securities and Exchange Commission (www.sec.gov) including, without limitation, information under the captions “Management's Discussion and Analysis of Financial Condition and Results of Operations” and “Risk Factors.” Semtech Corporation assumes no obligation to update any forward-looking statements in order to reflect events or circumstances that may arise after the date of this release, except as required by law.